tamed & cleaned up a bit. Niko was about 2 mos. old when he came to CR!FR. 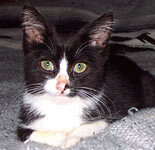 He had a huge tick on his neck, a disgusting "warble" parasite on his tummy, watery crusty eyes & a runny nose. Even though he was just a little guy, he was too feisty to bring to the vet until he was calmer. So I set him up in the bathroom with a cozy box & used the towel-wrap method to tame him. In just 2 days he was purring & relaxed. Before long he was wandering around exploring & getting into mischief. To Niko everything was a toy. Especially if it moved. A thumb on the remote, a shoelace, a pen writing, a page turning, a toe under a blanket, a piece of leaf on the floor, a lock of hair - all were pounced in the name of fun. Our poor cat Banshee, who's about 1.5 yrs older than Niko, was his favorite target. She was very sweet & friendly to him initially & they would play all day. 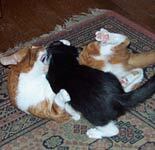 But Niko was fast & a bit too aggressive for gentle Miss Banshee. His constant playful harrassment grew old & she soon got fed up. No matter how loud she growled & threatened Niko was unrelenting. Now she won't have anything to do with him & is grumpy to other cats too, even friendly ones. Niko then made friends with Siren who we'd brought upstairs to socialize. She was about 5-6 mos. old & was rescued on the same day as Niko. They got along great, although soon he was a bit much for Siren too. Then we rescued little Lo-Lo. 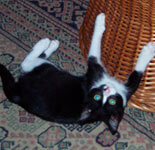 She was tiny but super crazy & was (& still is) always in full-on manic play mode, perfect pal for Niko. Niko is almost 2yo now & still very much a kitten at heart. He has a knack for knocking things over, effortlessly & usually unintentionally. He simply walks by something & if it's not nailed down, it'll end up on the ground. He's known as the Master of Disaster, Lord Chaos, & the Feline Dennis the Menace. Niko has unique ways to express the urgency of his hunger when he's in his "I'm mortally famished, feed mee!" mode & wants (more) food. He'll sometimes jump on your back or climb you by leaping up to your hips from the ground & clawing his way to your shoulder (thank goodness for nail clippers). Niko also has a sweet fatherly side. He's often seen curled up sleeping with the kittens or lovingly grooming them. Sharka, the shy tortie from Annandale, has a huge crush on Niko. 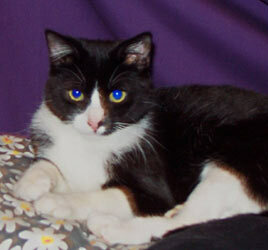 Niko's grown into a big handsome guy with an irreverant impish nature, a combination of playful & mischeivous. He's a one-of-a-kind character.